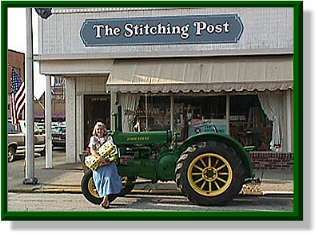 fabric store, in southwestern Indiana, specializing in 100% cotton fabrics. We have MODA fabrics, such as Kansas Troubles, 3 Sisters & Primitive Gatherings. Also, you'll find Jo Morton, Batiks and Reproduction fabrics from the 19th century to 1930's and tons of FLANNELS & SOLIDS. Lots of Riley Blake, Benartex, Hoffman, and other fabrics can also be found in our store! We invite you to check them out as you browse through our site! Please bookmark The Stitching Post for future reference and check back often, as we add new fabrics frequently. 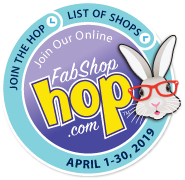 If you are searching for MS. BUNNY of the APRIL 2019 FABSHOP HOP, she won't be difficult to find. Spring is here and Mr. McGreggor is planting his garden. There is, of course, a CARROT PATCH. You can count on Ms. Bunny being right there in the middle of things!!! NOTE--USPS Postal rates have gone UP!!! Our flat rate shipping fee has increased to $7.50. Orders weighing 13 oz. or less will ship at a lower fee, according to weight. SORRY!!! $7.50 FLAT RATE SHIPPING FEE FOR ALL US ORDERS! EMAIL FOR INTERNATIONAL RATES!